10 years ago I wouldn’t have said that. 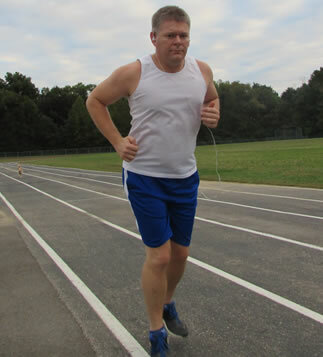 I’m 45 years old now and when I was in my teens, twenties and early thirties, I had no desire to jog. Just wasn’t my thing. One reason was because I’d always had bad knees and I’d been told that running was bad on your knee joints. Also, back in 2002 I had a herniated disk and I didn’t want to aggravate it. But when I was working at Network Solutions/Monstercommerce they had a little workout room that had a treadmill. A couple days a week I’d swing by there and jog about a mile on it. I think I may have worked up to a mile and half at some point. 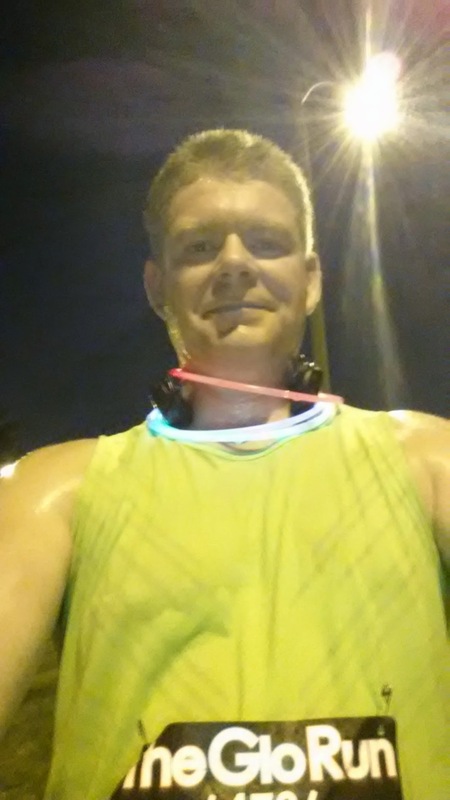 After I left Network Solutions I started jogging around my neighborhood. I’d do a mile. Maybe two. There was a couple decent size hills that I hated running up. Running down was fine. Running up not so much. Eventually, though I worked my way up to a 5k. From there it was a year or two before I started getting to around 5 miles. Now I run twice a week. Five miles without stopping and then a quarter mile walk to cool down. I try to throw in 100 roundhouse kicks on the straightaways after some of my runs to keep some muscle memory from when I used to do Tae Kwon Do. The weird thing is that, after years of running, my knees are fine. Oh sure, I’ll get the occasional pain but it’s only been bad enough to wear a brace a few times. And even then, I’ll only wear it for a week or two before I can go without it. And my back feels good as well. No issues there. I’ve run one 5k marathon so far and that was the Glo Run back in 2014. My time was 26:10 which is pretty darn good for me! At the time I was dieting and was about 13lbs lighter. I don’t think I’ll be up for a half marathon any time soon. I’m pretty happy where I’m at right now. If I can bump myself up to six miles on a regular basis that would be pretty good. Wear good shoes! Arch support is very important and if you don’t have it it can lead to all sorts of problems with your feet, knees, hips, shins, etc. I get a new pair about every 6 months. I’ve heard that you can put about 400-600 miles on a pair of shoes but if you’re feeling pain consistently, you may want to consider getting a new pair. Also, try not to go with ‘cheap’ shoes. I go with Nike running shoes. Don’t get basketball shoes. Running shoes are made for just that. Running. Listen to your body. On just about every run I will get a pains in various places: hip, knee, hamstring. But they’ll normally fade away after a half mile or so. It’s the pains that don’t go away that you have to worry about. I had been getting what felt like a pulled muscle in the middle of my upper back by my shoulders after I ran and it persisted for days afterwards. It was very uncomfortable to move. Even driving was a painful experience. I did some reading and found an article that said that your posture when you are running can contribute to back problems. I found that I was scrunching up my shoulders when I ran and was probably pretty tense. So around when I hit 3 miles I started letting my arms kind of dangle and flop around like a marionettes for about 15 to 20 strides to loosen me up and then I forced myself to keep my shoulders down. I would do this about every quarter mile after 3 miles. It’s different but I haven’t had any back issues since then. Have a good running playlist. These days it’s a must to have music going when you run. I’ve found that it helps you keep a pace to the beat and will motivate you. A good playlist for me has songs that have a good solid beat and no low parts. Sorry, no love songs in this mix. In my jogging playlist are quite a few songs from Shinedown’s latest release Threat To Survival and, of course, several Rocky songs. I try to have enough songs in my playlist so that it doesn’t repeat. Or, if it does, there’s only one or two that do. Mix it up, though. Add or remove songs when you feel things may be getting stale for you and you need some more inspiration. Good headphones are a must! I like using bluetooth headphones that cover my whole ear. Ear buds end up falling out of my ears too easily. You can find some pretty cheap bluetooth jogging headphones that are sweat resistant on Amazon for around $30. I also hate dealing with the wires from ear buds. An advantage of the bluetooth headphones is that, normally, you have buttons to skip forward or backward tracks. Handy when you need an extra boost and the current song just isn’t cutting it. Sweat band or towel. I’m a sweater. I’ll freely admit it. I sweat like a sieve and I need either a sweat head band or a towel to keep the sweat from getting in my eyes. I used to flick sweat off my brow all the time before getting a head band and it was almost distracting how much I had to do it. Use a little bleach on your workout clothes. An unfortunate side effect of sweating a lot is that it will stink up your work out clothes. I struggled for a while with this and finally figured out to use a few ounces of bleach in the load. It kills the smell but doesn’t discolor my clothes. It’s been a Godsend and I’ve thrown out much less workout clothes because of it. Use a running app. I started out using Sport Tracker but it didn’t give me the stats and such that I wanted. Plus, all my friends seemed to be using Endomondo. So I switched to that. Endomondo will call out to you the mile times and pace. Which is kind of nice. I use the free version of the app. I find that it does pretty much what I need with the free version. You can share your workouts to your choice of social media if you want. You can see my workouts on my Endomondo profile. I like to run on a track. I’ve done road work and probably will in the future. But, as I mentioned above, I hate hills. So, for now, I hit the track. I’m not much of a social runner, either. I kind of like to run by myself. The music helps me and I find it hard to hold a conversation with someone when I’m huffing and puffing and trying to concentrate on my breathing and pace. Something else that has helped motivate me is that my work has been doing a ‘WashU Moves’ challenge the last year or so. They give incentive prizes for 500k steps, 1 million steps and Personal Best. 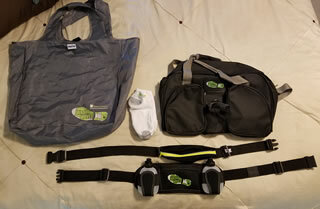 I’ve been able to get a couple nice sport waistband pouches, a sport dufflebag, a pair of running socks and a tote bag. Hope these tips help you. Leave a comment about your experiences if you want. I’d love to hear about it! Cheers! Written by: djlender on October 4, 2016.